Learn Python Visually is a modern breakthrough that makes learning programming more intuitive, easier, and fun. 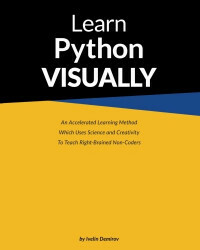 Using the most basic approach to learning that we all inherently know from childhood, "Learn Python VISUALLY" solves the comprehension problem that so many other books cannot seem to bridge. Visual learners retain information very differently than their left brained counter-parts, and thus benefit from different approaches. Full color illustrations help memory triggers as your brain never forgets an image, metaphor or schema. Illustrations can make a world of difference over strictly words on a page! If you found yourself struggling with programming, then this visual book might be your answer.